I first started practicing Hatha Yoga in 1990 when I went to a class at the local leisure centre with my Mum. I continued to practice yoga at weekly classes on and off for several years. I now practice and teach Viniyoga, which is the Sanskrit term for application of yoga. 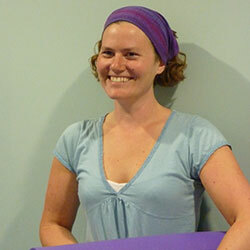 I began studying Viniyoga through a course of one to one sessions in 2008 with Yvonne Summons. More recently I have being attending individual lessons with Yvonne’s teacher Paul Harvey. These lessons have helped me to further develop my personal practice. I was inspired to deepen my yoga studies because of the benefits I have experienced from regular practice. These included improvements in my physical health and general well-being. The benefits I continue to experience inspire me to help others benefit from yoga. I enrolled on the Yoga Teacher and Yoga Therapy Practitioner Diploma, taught by Paul Harvey at the Centre for Yoga Studies in Bristol in 2009. I have been teaching yoga since 2010, initially as a trainee and now as a fully qualified yoga therapy practitioner. I have regular supervision sessions with my teacher Paul Harvey to discuss the best approach to teaching yoga to individual students and group classes. I am looking forward to continuing to study more of the cikitsā module as part of the continuation studies taught to yoga practitioners by Paul Harvey. In this module I will be deepen my understanding of how to work therapeutically with individual students. I am currently enrolled in an online yoga anatomy course with Leslie Kaminoff. I have complete the first trimester focusing on breathing which I mention in a news article you can read here. I am now working on deepening my understanding of the anatomy of the spine and am applying this knowledge when I’m teaching yoga. I assess the work of other teachers trained in the Viniyoga tradition and provide feedback on their group class teaching and supervise their planning of work with individual students. To find out more about me you might like to read this news article I wrote as a bio for a yoga day I lead a workshop at.